Copenhagen, Denmark: Super Middle: Lolenga Mock (42-14-1) W PTS 10 Dmitri Chudinov (20-2-2). Light Heavy: John Madsen (12-0) W PTS 10 Andreas Lynggaard (5-1). Light Heavy: Sven Fornling (13-1) W TKO 3 Jeppe Morell (8-2). Heavy: Pierre Madsen (11-0) W TKO 4 Davit Gogishvili (20-9). Mock marches on. The DRC-born veteran scored an important victory with a well deserved unanimous decision over former interim WBA middle champion Chudinov. Mock is a notoriously slow starter and Chudinov built an early lead. Mock finally got rolling and proceeded to out box the Russian “Night Wolf”. No real fireworks and many of the rounds were very close but Mock did enough to claw back Chudinov’s early lead and box his way to victory. Chudinov lost a point late in the fight for continually spitting out his mouthguard but it had no real impact on the outcome as Mock was a good winner. Scores 96-93 twice and 99-90 all for Mock. That makes it 11 wins in a row for the 45-year-old Mock since Mogens Palle brought him out of retirement. 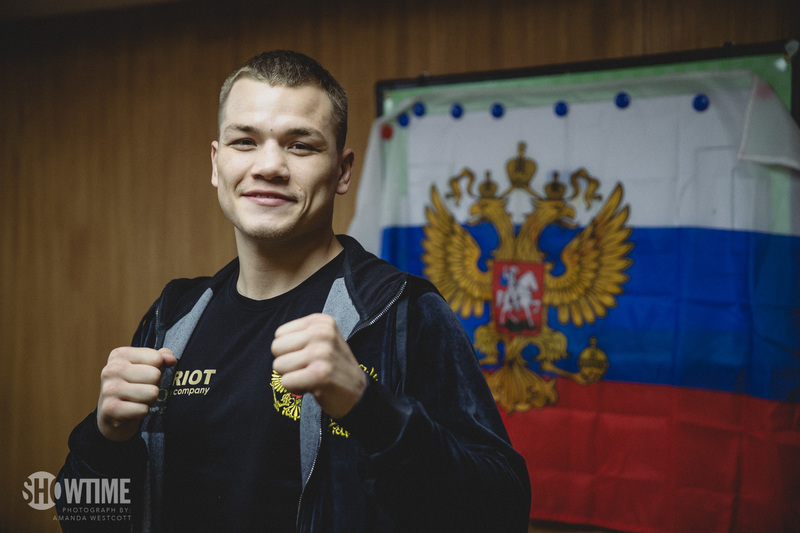 Currently the EBU No 12 Mock may now break into the world ratings as Chudinov was No 15 with the WBC and obviously the hope is to land the veteran a world title shot. He is a former European Union champion and in their 2003 fight had David Haye on the floor before losing to him on a fourth round stoppage. Chudinov, 31, had outpointed the then unbeaten Dane Patrick Nielsen in defence of his interim WBA title but lost the trinket when he was stopped by Chris Eubank Jr in 2015. He had rebuilt with six wins. In the fight of the night Madsen retained the IBF Youth title with a split decision over fellow Dane Lynggaard. Madsen made a positive start and edged in front but Lynggaard came back with a strong fourth round and from there it was a close hard-fought contest. Madsen was busier but Lynggaard picked and placed his punches well and impressed with his accuracy. The rounds were close with Lynggaard finishing strongly and the nod could have gone to either man but the higher work rate from Madsen just saw him come out ahead. Scores 97-93 and 96-94 for Madsen and 96-94 for Lynggaard. First defence of his IBF title for Madsen. Lynggaard was moving up to ten rounds for the first time. Fornling retains the IBF Baltic title as Dane Morell retires due to a serious cut. This had the makings of a good competitive fight. Swede Fornling edged the first round. Morell clearly took the second but just before the bell a clash of heads saw Morell suffer a bad cut over his right eye. Southpaw Morell boxed well to take the third but the cut was bleeding heavily and his corner retired their man. A stupid decision. As the cut was caused by a clash of heads Morell’s corner should at the very least have asked for a doctor’s inspection of the cut and if it had been decided he could not continue then as the fourth round had not even started it would have been ruled a no decision or a technical draw. Fornling, 29, was making the first defence of his IBF Baltic title and has won his last three fights. He won two bronze medals and two silver medals in the Swedish national championships before turning pro. Morell had reversed his other loss and looked unlucky to lose this one. Madsen gets yet another inside the distance win as he halts Georgian in fourth. Not one of Madsen’s best nights against an awkward southpaw in a messy fight. The Dane had Gogishvili down in the second and twice more in the third but none of the knockdowns looked impressive as Gogishvili put up very little resistance. After two more knockdowns in the fourth the fight was stopped. Ninth inside the distance win on the bounce and tenth overall for the 28-year-old “Pretty Ricky” Madsen. Nine fights outside Georgia for Gogishvili and eight losses by KO/TKO. Nove Pazar, Serbia: Super Feather: Serif Gurdijeljac (15-4) W PTS 10 Alex Rat (6-2-2).Light Heavy: Marko Nikolic (17-0) W PTS 6 Djordje Markovic (3-5-1). Home town boxer Gurdijeljac wins the vacant IBF Youth title with controversial unanimous decision over Rat. The contest was close with Gurdijeljac fighting with a cut received early in the fight but also being guilty of some careless use of his head. Rat looked to have earned at least a draw but all three judges gave it to Gurdijeljac on scores of 95-94. The 23-year-old local has won his last eight fights. Spanish –based Romanian Rat was 5-0-2 in his last seven fights going into this one. Nikolic moves to 17 wins with a comfortable points victory over fellow Serb Markovic. Nikolic was in control all the way with Markovic constantly on the retreat. The visitor took some hellacious punishment but stayed on his feet although nearly going down in the last. Nikolic took the unanimous decision on scores of 60-55, 60-54 and 59-55. The tall 28-year-old is a former three-time Serbian amateur champion who fought at the World and European Championships. Markovic overmatched but went the distance. Malvinas Argentinas, Argentina: Welter: Gabriel Ledesma (12-1) W TKO 5 Carlos Aquino (17-4). “Pitbull” Ledesma has no trouble retaining his WBO Latino title as he destroys Aquino. There was plenty of two-way action over the first three rounds. Although he was giving away height and reach and Aquino was throwing plenty of punches Ledesma was getting the better of the exchanges. He broke though in a big way in the fourth flooring Aquino with a right. Aquino beat the count but took more heavy rights which sent him staggering and he was given a standing count which helped him make it to the bell. A brave Aquino tried to match Ledesma’s power in the fifth but rights put him down twice more and the fight was stopped. The 23-year-old Ledesma, the Argentinian No 2, had been promoted from interim champion so this was his first defence of the full title and his sixth win by KO/TKO. Third loss by KO/TKO for Aquino who had been 8-2 in his last 10 fights and was Argentinian No 9. Quellon, Chile: Bantam: Jose Velasquez (17-6-2) W KO 4 Diego Luis Pichardo Liriano (17-15-1). Velasquez gets the year off to a good start as he knocks out experienced Liriano in four rounds. Velasquez was hunting Liriano down from the start but was loading up on his punches and not throwing enough with Liriano scoring with counters. Southpaw Liriano boxed well in the second showing good skills and landing some sharp counters. Velasquez was throwing crude, wide punches but was able to keep rolling forward as Liriano had no real power. Liriano continued to box on the back foot in the third but now Velasquez was getting through with some of his crude swings and near the end of the round he trapped Liriano on the ropes and landed two heavy punches which put Liriano down. He beat the count and the bell went as he got up. Velasquez was crude but effective in the fourth flooring Liriano twice with body punches. The end came when a right to the chin saw Liriano initially seem okay only to then drop to his knees and he stayed there for the full count. The 28-year-old Velasquez, Chile’s Fighter of the Year last year, was defending his WBA Fedebol title. He also holds the WBO Latino super bantam title. This is his eleven win by KO/TKO and his ninth win in a row but his crude style gives him limited horizons. Liriano, 32, an Argentinian-based Dominican who challenged for the IBO super fly title has now lost 9 of his last 10 fights. Shenzhen, China: Light: Yongqiang Yang (9-0) W TKO 3 Robert Kopa Palue (14-7-3). Yang adds another title to his collection as he halts Indonesian Palue late in the third round. The win gives Yang the vacant WBC Asian Boxing Council title to add to the WBO China Zone and WBO Greater China titles at super lightweight. This was his first scheduled ten round fight and his seventh win by KO/TKO against opposition that would be flattered to be described as ordinary. Indonesian champion Palue was 3-3-1 in his last seven fights. Accra, Ghana: Super Bantam: Isaac Dogboe (18-0) W TKO 5 Cesar Juarez 20-6). Cruiser: Abraham Tabul (11-0-1) DREW 10 Patrick Ferguson (10-0-1). Dogboe starts the year on a high as he floors Juarez twice on the way to a fifth round stoppage that nets him the WBO interim title. No sizing up here as Dogboe went straight into the attack. He was firing left hooks to head and body with Juarez unable to get any offence of his own going and the Ghanaian took the opening round. Juarez was marching forward behind a high guard in the second with Dogboe piercing the Mexican’s guard with jabs and again going in heavily with left hooks to the body. In close Juarez was landing some body punches of his own and seemed to shake Dogboe with a left hook. He tried to capitalise on that but was nailed by a peach of a left hook to the chin which put him down heavily. Juarez got up at eight and Dogboe had the Mexican under heavy pressure rocking him two or three more times but Juarez stayed on his feet. Juarez did better in the third. He managed to get in close and land hooks and uppercuts. However he was leaving himself wide open and whilst on the back foot Dogboe was banging home jabs and left hooks. In the fourth Juarez had success getting inside and scoring with hooks and uppercuts from both hands. Dogboe was landing some hard counters but the sheer aggression and quantity of punches from Juarez was forcing the Ghanaian to hold at times to smother Juarez’s attacks. There were some furious exchanges at the start of the fifth as Dogboe stood and traded. Juarez kept coming and had Dogboe on the back foot again until Dogboe exploded a vicious left hook to the chin of Juarez who stood still for a split second and then pitched back to the canvas. He got up much too early and staggered back across the ring which was enough to convince the referee that he was still badly shaken and the referee stopped the fight. It looked a bit of a debateable stoppage as Juarez might have regrouped if given the full eighth count but he was wobbling badly so the referee took no chances. The 23-year-old “Brave Son” gets his twelfth win by KO/TKO. He showed good skills and the two left hooks that scored the knockdowns were perfectly timed. Mexican Juarez, 26, suffers his first loss by KO/TKO. He has been on the floor a few times but always got up to last the distance which is why he complained of the stoppage. He lost a wide unanimous decision to Nonito Donaire for the WBO super bantam title in 2015 but he rebounded in impressive style by climbing off the floor to kayo the 26-0 Albert Pagara in 2016. Dogboe is of course calling out the real WBO champion Jessie Magdaleno who is currently sidelined with a wrist injury. There is talk of Magdaleno returning to action on 10 March by which time he will have been inactive for 11 months so he will probably want a fight before taking on Dogboe. When it does come off it will almost certainly not be in Ghana as only days before the Juarez fight Dogboe and his camp were appealing to the President of Ghana for financial support saying they were already $150,000 in debt over the costs of the fight. Magdaleno is a different proposition to Juarez. He is faster, hits harder and is also a southpaw but right now Ghana is celebrating Dogboe’s win and hoping it will give boxing in Ghana a boost.